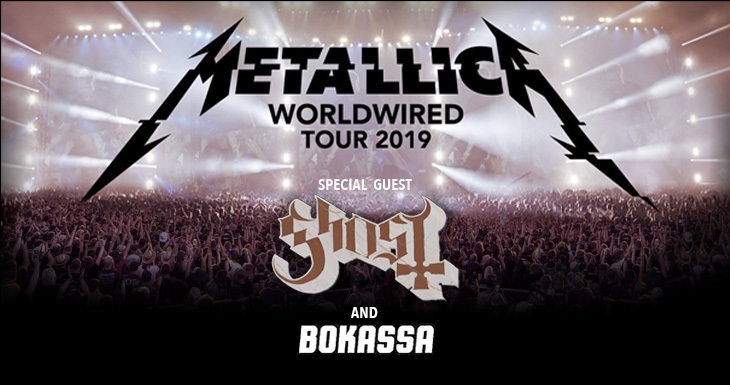 LOS ANGELES, CA - Monday, September 24, 2018 -- It is announced today that Grammy-winning, Swedish rock band Ghost will be Special Guest on all four European legs of Metallica's 2019 "Worldwired" Stadium Tour that begins on May 1 at the Estadio do Restelo in Lisbon, Portugal. 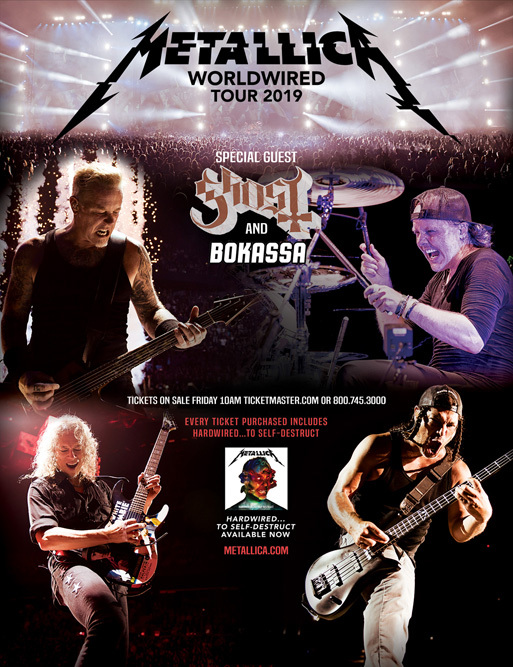 Ghost has shared festival stages with Metallica before, but this is the band's first invitation to join Metallica on tour. With Norway's Bokassa opening all dates, the three-band bill will play 25 stadiums from May through August. Tickets go on sale Friday, September 28 at 10AM local time. Log on to http://ghost-official.com for all purchasing details. Prior to joining Metallica for the summer 2019 European stadium tour, Ghost will headline its own "A Pale Tour Named Death" tour, first in North America kicking off October 25 in Dallas, Texas, and then in Europe beginning February 3, 2019 in Lyon, France. All Ghost headline shows can be accessed here. In North America, Europe and elsewhere around the globe, 2018 continues to be an extraordinary year for Ghost. Since its June release, the band's fourth full-length album Prequelle has been streamed north of 75-million times. The album's first single, "Rats," had accumulated more than 25-million streams and set a 2018 record for maintaining the #1 spot for nine consecutive weeks at U.S. Rock Radio. The companion music video for "Rats" has logged more than 12.5 million views in the U.S. alone. Earlier this month, Ghost played to a sold-out house at London's Royal Albert Hall. As the UK's Kerrang!wrote in its review, "Tonight is nothing short of devilishly incredible, largely because it's impossible to pick a standout moment from a set inundated with them."